A new post on the Office Web Apps blog discusses some of the major tenets that have been driving the design and engineering of this new service launching alongside the upcoming Office 2010 software. The post describes how the team focused on trustworthiness, the familiar Office user experience, and the high fidelity of the content provided by the Web Apps. From these notes, we can gleam a bit more insight into what the new Web Apps service is going to look like and how it will behave. One of the problems with some online file viewers and editors today is that they can “mess up” your document when you go to save it online. If the service in question doesn’t support a particular feature, for example, it won’t know how to properly display it. That won’t be the case with the Web Apps since they’re specifically designed to work hand-in-hand with the desktop software. For example, if a user uploads a file with a watermark, a feature which the initial release of Office Web Apps won’t support the editing of, the user can still make changes to the file and resave it without the Watermark being removed from the document. In other words, your files are safe. The Office Web Apps will deliver a familiar experience to the end user by offering a recognizable UI with many of the same features including matching icons, the same commands, the Ribbon interface at the top, and more. However, the goal is not to create an exact replica of the Office software UI. Instead, Web Apps will take advantage of the web platform’s strengths. Web Apps will also offer a similar experience to what you would have in Office, even though the effects of this may be subtle. To give an example, the blog post demonstrated the difference as to how Microsoft Word would behave when you hit “enter” in a table versus how a basic text editor would behave. 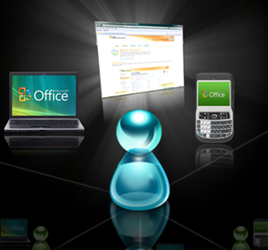 The Office Webs Apps will ensure that no matter what kind of file you’re working with, it will always appear the same whether it’s being viewed on the web or on the PC. Not only will it appear with the same formatting and layout, everything in the document will be consistent, too, whether that’s calculations, animations, pagination, etc. In this respect, Web Apps docs behave much like the Adobe PDF – always the same file no matter where it’s viewed.